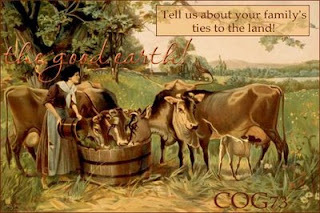 The topic for the 73rd Carnival of Genealogy is "The Good Earth". We are asked to write about our ancestral ties to the land. In Transylvania, my grandfather's father, Samuel Deutsch, grew apples, plums, tomatoes, and potatoes - or at least that is the recollection of my grandfather's older brother. Definitely plums, as that was turned into a plum brandy called slivowitz, which they then sold to a local brewery. I'm not sure how far back I have to go on my father's side to find farmers. The small towns in Lithuania and Poland from which they came may have been rural, but still, the generation that immigrated were craftsmen, mostly tailors and shoemakers, and it's likely they learned the trade from their fathers. My childhood was unequivocally suburban. I spent several summers at a camp in Michigan which had a barn, and a donkey named Jack (obviously named for the enjoyment of the campers.) My parents have friends with a farm in rural Missouri which I visited a few times -- which mainly meant getting to ride a horse, and go on a hayride. I also spent a few years at a college in rural Grinnell, Iowa. I enjoy open land, and could easily envision myself living on a farm, but not working it.